Leave the worries about transportation to and from Port Canaveral behind with this Fly, Stay and Cruise package offered by Cocoa Beach Suites. Flying into Orlando International Airport and need a shuttle to the Cocoa Beach Suites in Cocoa Beach, Florida? Cocoa Beach Suites we’ll pick you up! 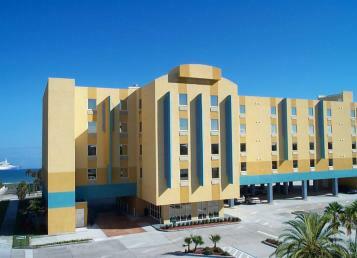 Simply call the hotel directly at (321) 783-6868 at least 24 hours prior to arrival and schedule your pick-up. Airport Transportation Pricing: 1 Person: $33.00 USD Flat Fee, One way (7am – 9pm) 2 Persons $50.00 USD Flat Fee, One Way (7am – 9pm) Each additional persons: $10.00 One Way, Flat Fee Lincoln Town Car (max 2 people:): $105.00 Flat Fee, One Way (7am – 9pm) *Extra charge for pick ups between 9p.m. and 7a.m. - $42.00 Flat Fee Payment for shuttle reservations will be taken at time of booking. Departure times to the airport are limited so book now.